Yplatform 2.0: Dream. Do. Discover. « Yplatform | global insights – local impact | Connect. Empower. Inspire. Yplatform 2.0: Dream. Do. Discover. 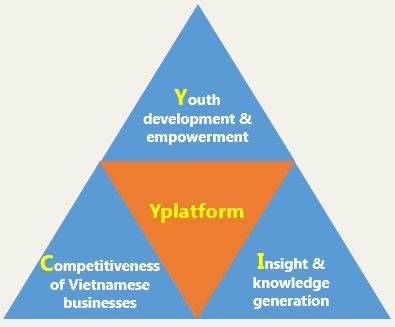 The vision of Yplatform is to create the connecting platform among global talented youth and businesses/organizations in the joint effort to strengthen Vietnam’s global competitiveness in different aspects. These are the gaps that Yplatform envisioned to fulfill and lay the first brick of a model that could possibly contribute something tangible to the development of Vietnam. We hope to create a conducive platform where like-minded individuals and stakeholders (regardless of locations, nationalities, or backgrounds) can network, share, and work together in the joint effort to strengthen Vietnam’s global competitiveness. Ychallenge is the flagship project of Yplatform, a premier international case competition successfully organized in 2011 and 2012, in Singapore and Vietnam. We worked with the Case Writing Initiative of Singapore Management University (SMU) and top management of leading Vietnamese corporations (such as Vinamilk, VNG Corporation, PNJ, Becamex, Tropdicorp) to develop case studies on their real business challenges. Participants challenged themselves in solving business issues from established Vietnamese companies, understanding more about company’s operations through the field trips, presenting their findings to company’s top management, and exchanging ideas with business managers, experts, judges and international friends. The case studies were later published to an international academic audience and used for teaching at top business schools. We hereby invite you to join in this journey to make the dreams happen! What it’s like working in the Y-Team? In the spirit of “Yplatform 2.0: Dream. Do. Discover.”, the experience working in the Y-Team will be genuinely different. As long as you have the necessary capabilities, commitment, and conviction, you will be given significant responsibilities, supports, and empowerment in coordinating and organizing the project. Impact & Quality: At Yplatform, the most important focus is on delivering impact. Whatever we do, it must leave some impacts. Join us if this is also what you believe in! Learning & Development:We believe in your potentials to learn and develop. Our past and current members learnt about many things including developing case studies, dealing with business partners, planning and organizing large-scale events, building communities, etc. and there are still a lot more to learn. Diversity & Synergy: Y-members come from all walks of life with different backgrounds, interests, ages, and locations. There is no common definition of them except that they all share a belief in Yplatform’s vision. We complement each other and create synergy from our differences. Globalization & Interconnectivity: Our team members are located in Singapore, Hanoi, Ho Chi Minh City, and soon in other countries around the world. We connect with stakeholders across the academia, business and third sector in different countries, in order to bring global insights that would translate into local impacts in Vietnam. The world is global and interconnected – this is what we believe! Vision & Sustainability: We have a vision, and we are in this for the long-term. Our vision, as mentioned above, is to “create the connecting platform among global talented youth and businesses/organizations in the joint effort to strengthen Vietnam’s global competitiveness in different aspects”. Our members consist of both talented students and young professionals, and we believe in the spirit of “Pay It Forward”. Join us if you would love to be in this for the long-term as well! We hope to create a place where long-lasting friendships are found, dreams are shared, like-minded people meet together and learn from each other, and where we can discover more about the world as well as our own potentials. We create impacts, but we also enjoy the process of doing so. We are all different, but our strength lies on our diversity. We are far from perfect, but we improvise along the way, and we shall become better everyday. Let’s join us to build a cool team, organize cool stuffs, learn cool things, and engage with cool personalities! At Yplatform, it is NOT so much about YOU joining US. It’s more that WE exchange our dreams, trying to find some common grounds, doing something together, and learning and improving everyday. Let us share our passion together! That’s our spirit and we look forward to talking to you soon! Check out our Teams & Roles in the locations below. We would love to hear from you, and we would be very happy to discuss further. We will make sure to reply as soon as we can! Let’s share our passion together!